The "Take It!" came from my getting out to clear the car from snow after the sun had come out and was in a clear sky. The shadows formed were sharp and gave full reign to imagination. On the hood of the car it almost seems as if there is a shadow that is casting its own shadow on a downward and forward slant. This is of course not possible - but fun to think of. The second shadow sort of looks like a peace sign coming from the trunk of the tree in the foreground - rather like a hand within a full sleeve , protruding upward toward the front right of the car. Figure imaginings from shadows are for me - as much fun as finding shapes in clouds. 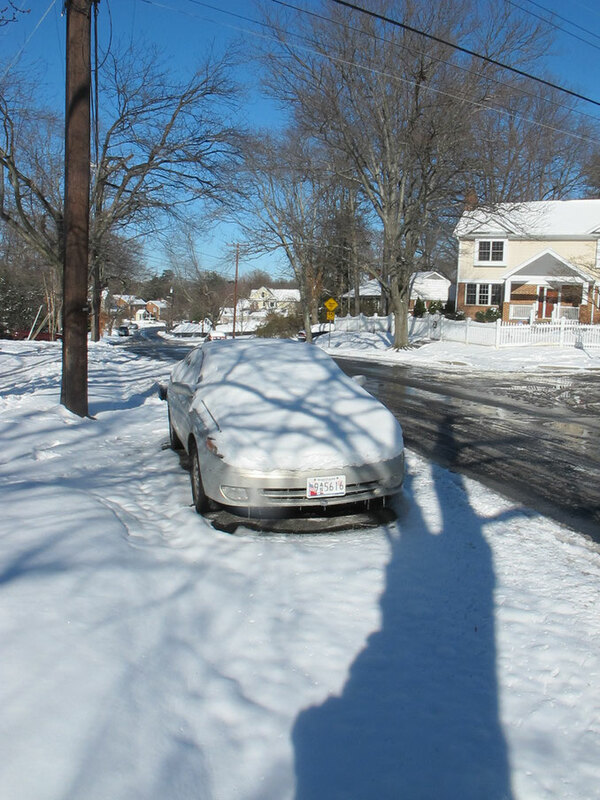 PS: Yes, I did clear the snow from the car, and while the shadows had shifted due to the sun moving in the sky - the shadows cast were not the same on the exposed silver paint of the car as they were on the brilliant white of the snow. Looks like a spider web on the car. Pretty neat looking. That looks beyond cold! I think I may have opted to stay in by the fire. Open the door and see this, back inside I go. This looks like one of those times a garage would have been awesome. However in having one you would not have gotten the cool photo, so maybe its a good thing. Did you happen to build a snowman while you were out there? Looks like a beautiful day and a perfect setting. I'm with Mike on this one, it does look like a web. Great looking picture. It did look like a gorgeous day out there.